The force has always been strong with me. 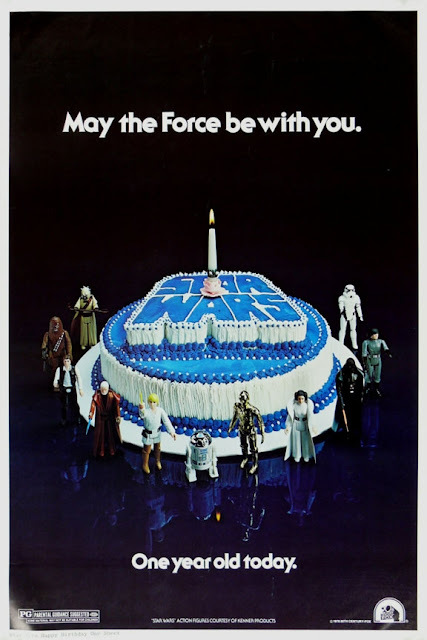 I was born in the same calendar year that Star Wars made its worldwide debut.. I’ve always taken it as something of an omen that I was born the exact same year as the film franchise that redefined the movie industry as we know it. It played a large part in shaping my tastes as a movie buff. I’ve been a Star Wars fan for so long, that I sometimes forget that the relatively unconventional way I initially became acquainted with it. I was indoctrinated long before I was even old enough to truly understand it. Star Wars was perhaps the first film franchise other than Planet of the Apes to be sold as a complete experience to its target audience via its merchandising. I felt like a part of the universe before I ever got to see any of the films. For the first few Christmases of my childhood I was neck deep in Star Wars toys. I had Kenner’s Death Star playset, complete with a trash compacter full of foam pieces and a plastic Dianoga monster. I also had an X-Wing fighter. I also had a small collection of the original Kenner action figures, which my parents would buy sporadically. I had the one of Luke dressed as an X-Wing pilot. I also had Obi-Won Kenobi, Vader, Yoda, and Chewbacca. Once, my grandmother bought me a Lando Calrissian action figure. The next day I brought it to my daycare class. A kid asked to play with it and subsequently threw it to the floor like a high-bounce ball. I then got up and shoved the kid to the floor, for which I was given a swift spanking. Even at the tender age of four, I took Star Wars deadly serious. Those toys fed my imagination far more than the films themselves ever could. My first theatrical experience with a Star Wars film turned out disastrously. After much badgering, my mom took me to see The Empire Strikes Back in theaters during what I assume was its initial release. Upon entering the theater lobby, I became deathly afraid of the prospect of seeing the fearsome Chewbacca on the big screen in a darkened theater. I threw myself on the floor and bawled, refusing to into the theater. Using a bit of child psychology, she left me right there and took my cousin inside. A troop of girl scouts found me and promptly returned me to her side. I fell asleep in my mother’s arms soon after the movie started. By the time Luke arrived at Cloud City, I awoke and watched the remainder of the film attentively. My mother, though thoroughly annoyed by this point, was glad I finally calmed down. I didn’t actually see the original Star Wars until it finally came out on VHS in 1982. My uncle rented it from a video store, and brought it over so my dad could make a copy of it for me. Upon my first full viewing of Star Wars, I found it…boring. You read that right. My first ever viewing of a film that had been shaping my young life up until that point, and I was disappointed. It contained too much talking for my young tastes at that time. Miraculously, my infatuation with the Star Wars universe not only survived that traumatic experience, but actually increased with time. I was super excited to see Return of the Jedi the following summer, so much so that made my mom take me to see it twice. The first attempt to see ended in disappointment. Lines at the Bronx movie theater we went to snaked around the block. Wait times easily stretched into hours. On one overcast day, the manager came out to loudly and belligerently inform the crowd that all remaining showings for the day had sold out. As the he tried to interest the crowd in other films on the marquee, such as Spacehunter: Adventures in the Forbidden Zone, he was booed like a wrestling villain. Upon seeing the film, I was terrified during Luke’s fight with the Rancor, and breathless during his duel with his father. One thing I was not, even during the slow stretches of the film, was disappointed. That same summer, HBO began showing the original Star Wars repeatedly. Despite my early disappointment with it, I grew to know the film back to front. Lines of dialogue and even certain shots became second nature. Despite my inability to appreciate greatness, Star Wars became a permanent part of my DNA. Star Wars merchandise continued to feed my imagination during the lean years, thanks to storybooks on cassettes and television specials. In 1985, HBO Showed The Empire Strikes Back for the first time. 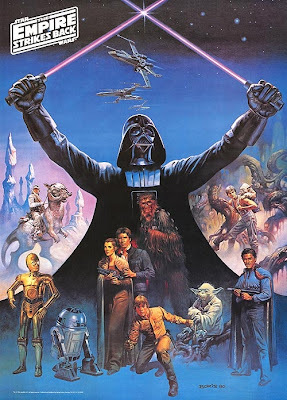 By then, Star Wars was passé to me, as The Transformers and Voltron seemed far more exciting. Still, I recorded HBO’s first ever broadcast of The Empire Strikes Back on VHS tape. Upon finally watching it in its entirety, I fell in love. It mesmerized me. I loved the feeling of desperation as the crew of the Millennium Falcon escaped cloud city. I sat in awe at the idea of Luke receiving a mechanical hand that could actually feel pain. Something about the final stretch of that film felt like magic to me. By the time the trilogy was re-released on VHS in the holiday season of 1990, I was a disciple. I watched the original for the first time in five years up until that point, and finally understood it. Now, here I am at 35 years old, the same age as that first Star Wars film. The brand name has become omnipresent since the 1990’s. Even as I grow ever wearier of the endless revisions and re-releases, I still have an undying affection for those first three films. Nothing will ever change that, not even the fact that they are no longer available in their unaltered versions. Not even the seemingly inarguable awfulness of the prequels. On one level or another, Star Wars has always been there for me, and I can never fully turn my back on it. I can only hope that, like a wayward son, it someday finds its way back to its roots. Either way, I’ll never stop loving it.